March 28, 2019, Westbury, NY—As the New York State Legislature continues to grapple with its 2019-20 State Budget, MSSNY is hopeful that any discussion regarding legalization for recreational or “adult use” of marijuana be taken out of the budget. Since Colorado, Washington, Oregon, Alaska, and the District of Columbia (Washington, DC) legalized marijuana, past-month use of the drug has continued to rise above the national average among youth aged 12–17 in all five jurisdictions (National Survey on Drug Use and Health [NSDUH], 2006-2017). Many people believe that marijuana is not addictive, but brain scans of marijuana users show changes in the structure of the brain’s reward center to be consistent with addiction (Gilman et al., 2014). Colorado Department of Health Services, Office of Behavioral Health reported in 2017 that marijuana is the second most implicated drug—after alcohol—in addiction treatment admissions. These are just some of the reasons that we have been strong in our opposition to legalizing this substance. 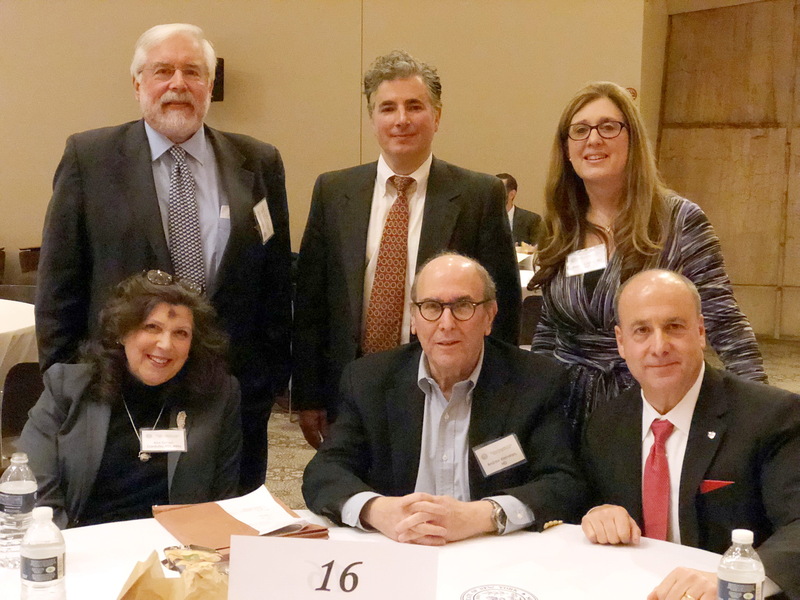 We have been making some headway and part of this effort has been through collaboration with the Medical Societies of New York, New Jersey, Connecticut and Delaware. We offered a joint statement opposing the legalization and just this week the New Jersey Legislature was unable to muster the votes for passage. However, we have heard from many legislative members about the need to “decriminalize” certain aspects that lead to disparities in arrests and convictions of minorities that come from involvement with marijuana. All of us have different views on what “decriminalization” means in the context of marijuana. Does it mean lower fines, no jail time? Or does it mean treatment rather than arrest? Should we expunge a criminal record related to marijuana convictions? These are all questions that will need to be answered. We will be asking the other states to join with us in urging that their respective governors and legislatures of each state have a meaningful discussion on “decriminalization.” While we recognize that each state has its own set of laws and regulations, perhaps it’s time for us to combine our effort in resolving this issue of ensuring that all individuals are treated equitably under the law. Our geographical nearness should permit the creation of an interstate task force to allow us some common sense rules that would be applicable along state lines. 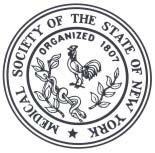 Founded in 1807, the Medical Society of the State of New York is the state’s principal non-profit professional organization for physicians, residents and medical students of all specialties. Its mission is to represent the interests of patients and physicians to assure quality healthcare services for all. Happy Doctor’s Day, tomorrow, March 30! On behalf of MSSNY, I want to thank you for your devotion to your patients and our profession. Your commitment to caring for your patients helps to improve our communities and our society in general. It’s been a busy week. I had hoped to spend a little time watching my favorite NCAA teams, the Syracuse Orange, and the University at Buffalo Bulls charge into the Sweet Sixteen of the NCAA Basketball tournament. Alas, it was not meant to be. Both suffered crushing defeats accompanied by much wailing and gnashing of teeth by me and the other diehard fans in the Madejski family room. Proposals to legalize the recreational use of Marijuana continues to be an issue of statewide and national concern. I have received comments from a few readers questioning why we are spending time on this issue. I’ve responded to them individually, but thought it might be worth reviewing where we’ve been and where we are going. To begin with, we are very sympathetic to the goals of many seeking legalization regarding the unfair and arbitrary application of current laws. We agree with the concept of decriminalization. However, we are spending time on this issue because MSSNY (and the AMA) policy is based on science and advocates for the best care of our patients, and prevention of reasonably avoidable harms to our citizens. We are very concerned that the push for legalization of recreational marijuana has been funded by an evolving industry that has been given a pass on proper testing of their pharmacological products with regards to usual standards of efficacy and clarification of risk. We are watching Big Tobacco attempt to morph into Big Marijuana before our eyes and create a new generation of users of an addictive product. This industry has also draped itself in specious arguments that wider access and use will result in a panacea for multiple disease states and economic benefits to state governments. The emerging data from states that have legalized recreational marijuana is disturbing at best. Harms are clear, benefits less so. Most physicians understand the importance of dealing with this complicated substance in a scientific fashion. Potential harms could be avoided by obtaining better data on the benefits and risks of both medicinal and recreational use. I also want to make clear that we are in favor of decriminalizing marijuana. New York should use the data from the ongoing state experiments to inform our policy creation in New York with regards to a product with well-defined harms. Importantly, this means we need to change federal law to reschedule marijuana to allow more, higher quality research to answer the many questions about medicinal and recreational use. Again, this need to be based on science, not anecdote. New York is not alone in dealing with this question. While, there is a furious, well-funded push by the marijuana/ tobacco industry to push recreational marijuana through before our society wakes up to the potential harms, we have our own allies. We have been working with county health officials, PTAs, school administrators, and substance abuse councilors who share our concerns. If you will forgive my Hamilton reference, we don’t have Laurens, Mulligan and Marquis de Lafayette, but we have reached out to our friends in New Jersey, Connecticut and Delaware .Thanks to Dr. Poole, Dr. Gruss and Dr. Dahlke for their leadership and courage. New Jersey was scheduled to pass a bill for recreational marijuana this week. The vote wasn’t taken, in part due to the advocacy of the Medical Society of New Jersey in concert with MSSNY and our allies. We are hopeful that New York has taken legalization out of its soon to be finalized State Budget, but one never knows until the last Budget bill is passed. Connecticut remains under pressure for a revenue fix which, if based on marijuana as opposed to tolls, will have much greater financial and societal costs down the road. It is our duty to speak as physicians to evaluate the available information, seek out the answers to the known unknowns, and then speak out on behalf of our patients, fellow citizens, and ourselves. Thanks to all for your contributions to the conversation. At press time, while several of the Budget bills were printed, there were still multiple outstanding issues that were complicating a final agreement between the Assembly, Senate and Governor for a State Budget due by April 1. Here is a quick synopsis of some of the top issues being advocated by your Medical Society. LEGALIZING RECREATIONAL MARIJUANA – Reports were that the legalization of “adult use” or “recreational” marijuana use was not going to be in the final State Budget, as had been urged by MSSNY and several other groups. EXCESS INSURANCE – Reports were that the historical funding the Excess Medical Malpractice Insurance Program that had been proposed in the Governor’s Budget and supported by MSSNY was to be included in the final Budget. MEDICAID – There has not been a final determination on several Medicaid proposals, including the proposed $80/patient Medicaid cut for deductibles for patients covered by Medicare and Medicaid that the Assembly and Senate had rejected in its one-House Budgets and strongly opposed by MSSNY. BEHAVIORAL HEALTH PARITY – There is momentum towards strengthening New York laws that assure comprehensive health insurance coverage for mental health conditions and substance abuse services. MSSNY working together with the NYS Psychiatric Association supported these proposals. These include provisions that would remove prior authorization for MAT, and strengthening New York’s “gag” laws that provide important legal protections to physicians and other health care providers who file complaints with state agencies about potential insurer violations. WORKERS’ COMP (see related article)– The Legislature and Governor reached agreement on a modified proposal that expands the use of certain health care providers in WC that also seeks to address some carrier-imposed barriers to patient care and preserves the historical peer review role played by the county medical societies. MSSNY had raised concerns with this proposal. OPIOID TAX – Reports were that a revised $100 million tax on opioid manufacturers and distributors would be included in the final Budget. Earlier this week, MSSNY, the NYS Academy of Family Physicians and the NY Chapter of the American College of Emergency Physicians joined patients, pharmacists and several legislators to raise concerns with the aspect of this proposal that would permit the cost to be passed on to pharmacies, hospitals and, in some cases, patients. PUBLIC HEALTH– Last week the Senate and Assembly passed legislation to create a Maternal Mortality Review Board (A.3276, Joyner/S.1819, Rivera) instead of acting on the Governor’s Budget proposal. MSSNY supported this proposal. Instead of including in the State Budget, the Senate has advanced to the floor legislation (S.2833, Savino) to raise the age of tobacco/e-cigarette sales from 18-21. The Assembly recently passed identical legislation on this issue (A.558, Rosenthal). MSSNY supported this proposal. PBMs – There was progress being made towards the inclusion of language in the State Budget to increase the transparency of financial arrangements made Pharmaceutical Benefit Managers (PBMs), and its connection to health insurer formulary and tier development. Please stay tuned for further updates. With a new medical fee schedule to begin Monday, April 1 that will provide long-overdue increases to physicians treating their patients covered by Workers’ Compensation (WC), the Legislature and Governor agreed to a WC package of reform in one of the State Budget bills (– pp.16-32) that would expand the types of practitioners who can treat and be reimbursed for treating injured worker patients while at the same time seeking to reduce some of the carrier-imposed barriers to injured workers receiving needed medical care and treatment. The bill would expressly permit injured workers to receive treatment by Nurse Practitioners (NPs), Social Workers, Physician Assistants (PAs), acupuncturists, Physical Therapists (PTs) and Occupational Therapists (OTs) acting within their statutory defined scopes of practice. For example, this means that a NP will no longer need to be employed by a physician to provide care to an injured worker. MSSNY raised concerns during these negotiations regarding the lack of express requirement for some of these professionals to coordinate with a specialized physician for the care of injured workers. However, that concern was not fully addressed. We note that the bill would prohibit these newly listed health care professionals from performing Independent Medical Examinations. It would also specify that Acupuncture, PT and OT care could only be provided pursuant to a referral from a physician, podiatrist or NP, and that the report of a PA, PT, OT or acupuncturist could not be used as evidence to determine that a particular injury or illness is work-related. Expressly prohibiting an employer, carrier, or third-party administrator from attempting to interfere with the selection by the injured employee of an authorized medical provider, including attempting to direct that the injured employee seek treatment from a specific provider or type of provider selected by the employer, carrier, or third-party administrator. Eliminating the 3-arbitrator panels for review of disputed medical bills, so that every dispute would only need to be reviewed by a single arbitrator in the same profession as the professional bringing the dispute (the arbitrator can continue to be a physician recommended by MSSNY). All school health forms data would need to be in the same order (yet to be determined), thereby allowing various EHR systems to generate the form instead of having to force a mandated form into the EHR system. There was also discussion about MSSNY and AAP reaching out to physicians about whether their systems would allow for formatting in the designated order. There was also discussion about another school year delay in use of the form until a cover sheet and a final format for the form has been agreed upon. There will be an implementation plan once format and cover sheet is agreed upon. Assemblymember Richard Gottfried’s A.3077 passed the Assembly on Tuesday and Senator Julia Salazar’s companion S.4335 is currently in the Senate Health Committee awaiting action. If enacted, the policy would require the creation and use of uniform credentialing, re-credentialing and referral forms for physicians and other providers to use for the purposes of applying for and being maintained on a health care plan’s provider panel and hospital’s staff. The intent of this legislation, which is supported by MSSNY, is to streamline administrative processes, reducing the time physicians and their staff spend on the paperwork and administrative tasks necessary to obtain and maintain participation in an insurer’s network and to refer patients to a specialist. During credentialing, physicians present documentation of their professional privileges, licensure, evidence of malpractice insurance and malpractice history to such health care plan or hospital for their review. While many use a shared system, there are still situations where insurers use different forms and methods for credentialing and referrals. A uniform method, created with collaboration from all stakeholders would reduce redundancies and would alleviate some of the cumbersome burdens on physicians and their staff. In light of the measles outbreak in New York State, the State Education Department has issued emergency regulations giving nurses authority to provide immunizations pursuant to a written non-patient specific order and protocol prescribed or ordered by a licensed physician or a certified nurse practitioner. The nurse needs to be certified in CPR and ensure that anaphylactic agents, syringes and needles are available at the location whether the immunizing agents are being administered. Currently there a two major measles outbreaks in New York State communities with very low vaccination rates. Thus, it is critical to make such vaccines available to as many children and infants as possible to protect them from this disease. According to the CDC, measles is a highly contagious virus. The emergency regulations expand access to seasonal inﬂuenza and measles vaccines for infants, children and adults effective beginning with the current inﬂuenza season and measles outbreaks. The New York Attorney General’s Health Care Bureau released a report summarizing the results of its Health Care hotline from 2018. Specifically, the report noted that the hotline handled nearly 2,000 consumer complaints and another 2,400 were referred to other agencies with appropriate jurisdiction. A Health Plan incorrectly processed coverage for fertility treatments as an Out-of-Network Benefit. A health plan error delays payment for Emergency Surgery. A physician improperly coded a “preventive” colonoscopy as “diagnostic”. Federal District Court Judge John D. Bates issued a decision this week that struck down a United States Labor Department rule that would have expanded access to Association Health Plans (AHPs) – insurance plans for covering the employees of independent employers that would not be required to conform to ACA mandates, such as essential benefits coverage requirements and annual and lifetime limits. MSSNY and the American Medical Association had joined the New York Attorney General as an amicus to the successful lawsuit that was filed by a group of attorneys general representing 11 states plus Washington, DC. The lawsuit contended that the administration’s ruling violated Affordable Care Act (ACA) and Employee Retirement Income Security Act (ERISA) provisions. Health Matters for Women on Endometriosis Webinar To Be Held April 23. The Medical Society of the State of New York is proud to announce a live continuing medical education (CME) webinar on a women’s health topic entitled “Health Matters for Women: Endometriosis” on Tuesday, April 23rd, 2019 from 7:30 AM to 8:30 AM for all physicians and other health care providers. To pre-register for “Health Matters for Women: Endometriosis,” please click here. 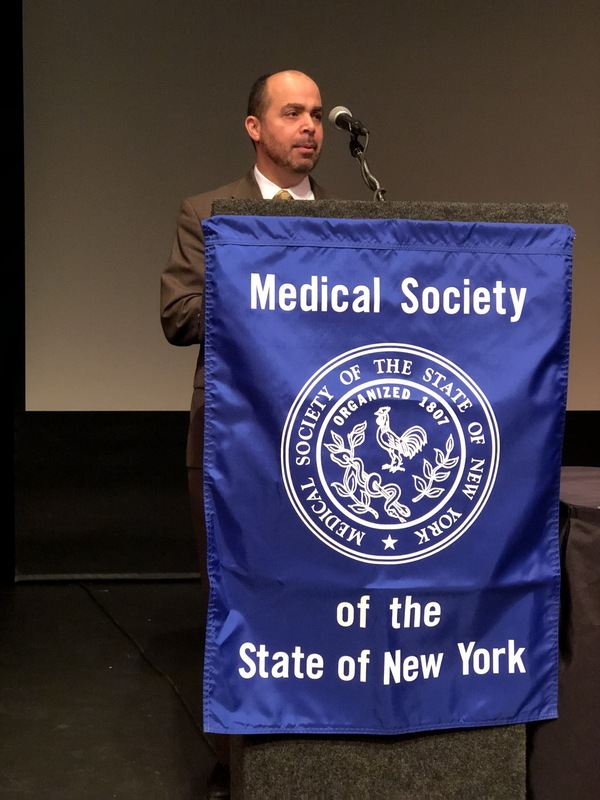 The Medical Society for the State of New York is accredited by the Accreditation Council for Continuing Medical Education (ACCME) to provide continuing medical education for physicians. The Medical Society of the State of New York designates this live activity for a maximum of 1.0 AMA PRA Category 1 credit TM. Physicians should claim only the credit commensurate with the extent of their participation in the activity. The Medical Society of the State of New York designates this live activity for a maximum of 1.0 AMA/PRA Category 1 creditsä. Physician should only claim credit commensurate with the extent of their participation in the activity. The Medical Society of the State of New York designates this live activity for a maximum of 2.0 AMA/PRA Category 1 creditsä. Physician should only claim credit commensurate with the extent of their participation in the activity. Be sure to register for the next Medical Matters interactive webinar, What’s Your Diagnosis? Infectious Diseases This program will include interactive components for participants. You will be asked to answer questions about a case and discussion will follow. Find out if you’re fully prepared to diagnose and treat an infectious disease. The NYS Department of Health has launched its prevention agenda for 2019-2024 and has announced the creation of a new website. The Prevention Agenda 2019-2024 is the state’s health improvement plan and it is designed to improve the health of New Yorkers. The Prevention Agenda was developed in cooperation with various stakeholders, including the Medical Society of the State of New York. This is the third cycle for this statewide plan and MSSNY has been involved since 2008. The agenda includes five major health areas that include: 1) Prevention of Chronic Diseases 2) Promotion of Healthy and Safe Environment 3) Promotion of Health Women, Infants and Children 4) Promotion of Well-being and Prevention of Mental and Substance Use Disorders 5) Prevention of Communicable Diseases. A copy of the plan is here and a copy of the goals are here. At the request of MSSNY, our General Counsel, Garfunkel Wild, P.C., met with the New York State Department of Health (DOH) to discuss DOH’s opinion concerning Zocdoc’s new pricing model scheduled to go into effect on April 1, 2019. DOH had issued an opinion that Zocdoc’s change in pricing model from charging customers a flat annual fee, to a reduced annual fee with per booking fees based on physician specialty, does not constitute an illegal referral business or fee splitting under New York law. After that meeting, DOH advised Garfunkel Wild that DOH’s opinion is still valid. Zocdoc previously advised that it was also seeking guidance on its new pricing model from the federal government. To date, Zocdoc has not advised us that it has received such guidance. However, Zocdoc had previously advised that it has modified its electronic scheduling platform to not accept appointment requests from patients who self-identify as Medicare or Medicaid beneficiaries. Whether to participate with Zocdoc under its new pricing model remains a business decision for physicians and their practices. Any MSSNY member who requires specific guidance or has questions should contact MSSNY for further information. San Clemente, Calif.-based Sovereign Health is suing Anthem and its Blue Cross entities for sending more than $1.3 million in payments to patients that is allegedly owed to facilities that treated them, according to CNN. The lawsuit alleges Anthem is sending payments directly to patients after they seek out-of-network care to pressure providers into joining its network and accepting lower reimbursement, according to the report. The patients are supposed to send the money to providers, but some patients don’t. Arthur Caplan, PhD, director of medical ethics for New York University’s School of Medicine, told CNN it is “insane” to send reimbursement directly to patients. “I’m enormously surprised that anyone would think this is a doable approach,” he said. Access the full CNN article here. The majority of health plans aren’t “making meaningful progress” on prior authorization reforms, according to a physician survey released by the American Medical Association. The survey took place in December 2018 and included responses from 1,000 physicians on their experience with prior authorization. Just 8 percent of physicians said they work with a health plan that allows some providers to be exempt from prior authorization requirements. Phone and fax are still the most commonly used methods for prior authorization, according to the physicians. Only 21 percent of physicians said their EHR system completes electronic prior authorization for prescription medications. Most physicians (88 percent) said the number of drugs that require prior authorization has increased. Eighty-six percent said the same about the number of services requiring prior approval. Nearly 7 in 10 physicians said they find it difficult to determine if a prescription or medical service requires prior authorization. Eighty-five percent of physicians said prior approval processes interfere with care continuity. MLMIC is pleased to invite you to attend its Risk Management Program on Thursday morning, April 11, 2019, at the Westchester Marriott Hotel in Tarrytown, New York. The program will run from 9:00 a.m. to 12:45 p.m. This year’s program will address several topics including Top Risks of the Office Practice Setting, Effective Coordination of Hospitalist Care, and High Exposure Liability Cases. Qualify for participation in the “free” Section 18 excess medical malpractice insurance program. There is no charge to attend however, pre-registration is required. All are welcome to come learn about the importance of getting involved in physician grassroots advocacy and effective messaging from local Assemblymember David Buchwald representing parts of Westchester County. Assemblymember Buchwald worked to bring ethics reform to Albany through amending the NYS Constitution to include pension forfeiture for public officials convicted of corruption. Experienced politically active physicians will discuss the many tools MSSNY offers physicians to assist them in engaging in strategic community and state-wide advocacy efforts on behalf of their patients and for the profession of medicine in New York State. For as long as you will be a physician, local community involvement and grassroots advocacy on behalf of your patients and your profession will be essential. Event is free to MSSNYPAC members. Download flyer. Join online at www.mssnypac.org/contribute or donate at the event. RSVP to mssnypac@mssny.org. CVS Health sent letters to 60 drugmakers asking them not to increase the net costs of their drugs in response to a proposed rule that would overhaul the rebate system, according to an Inside Drug Pricing news report. HHS proposed a rule Jan. 31 that would eliminate rebates — the discounts drugmakers pay to pharmacy benefit managers. The rebate ban, which is expected to be finalized before health plans’ deadline to submit 2020 Medicare bids in three months, would cut profits for PBMs and health insurers. The ban also would make it hard for insurers to accurately set Medicare Part D premiums. Medicare plans rely on drugmakers’ existing prices to design plans for the upcoming year, and they would need to redesign those plans if drugmakers increased drug prices. Rebates also been have been used to keep insurance premiums low, but if rebates are instead passed along to patients at the pharmacy counter, patient premiums could go up. HHS officials said health plans will do all they can to keep these increases as small as possible. Join us at the OMSS Annual Meeting for an interactive presentation by Garfunkel Wild on MEDICAL RECORDS, including the impact on records of the controlled substances “epidemic,” what to consider when emailing and texting, dealing with non-compliant patients, additional areas of exposure from EMRs, and what to include in a telemedicine record. Gender imbalance in medicine and academic sciences still exists. Hear three women physicians who have achieved significant leadership positions describe their own pathways, provide advice on how to achieve success, and show how to overcome gender bias, gender pay gaps and system-wide barriers to career advancement. Learn how to achieve success in your career! * The Medical Society of the State of New York (MSSNY) is accredited by the Accreditation Council for Continuing Medical Education (ACCME) to provide continuing medical education for physicians. The Medical Society of the State of New York designates this live activity for a maximum of 1.0 AMA PRA Category 1 Credits™. Physicians should claim only the credit commensurate with the extent of their participation in the activity. ** The Medical Society of the State of New York (MSSNY) is accredited by the Accreditation Council for Continuing Medical Education (ACCME) to provide continuing medical education for physicians. The Medical Society of the State of New York designates this live activity for a maximum of 1.5 AMA PRA Category 1 Credits™. Physicians should claim only the credit commensurate with the extent of their participation in the activity. Essen Health Care will host an IMG Symposium on April 18 from 5-8 pm at Jacobi Medical Center in the Bronx. 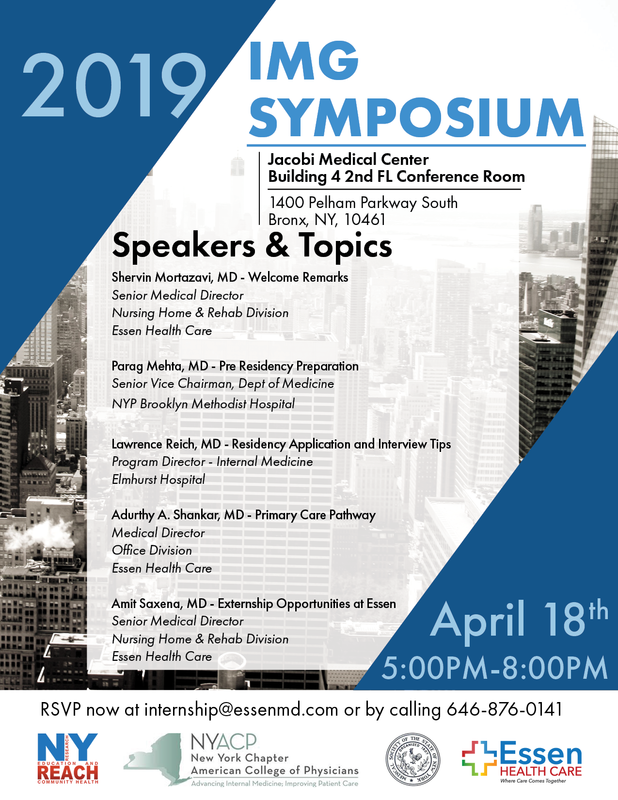 MSSNY member Parag Mehta, MD, Senior Vice Chairman, Department of Medicine at NYP Brooklyn Methodist Hospital will speak about Pre-Residency Preparation. Other topics include Residency Application and Interview Tips, Primary Care Pathway and Externship Opportunities. RSVP at internship@essenmd.com or by calling 646.876.0141. Click here for more information on the symposium. Dr. Anthony Patrick Santomauro, retired chief surgeon at Kenmore Mercy Hospital, died March 2 in New Smyrna Beach, Fla., where he had lived for the past 20 years. He was 89. Born in Buffalo, the son of longtime Buffalo restaurateur Anthony V. Santomauro, he was a 1947 graduate of Amherst High School. He earned a bachelor’s degree from Denison University in Ohio and his medical degree from the University at Buffalo. A vascular surgeon, Dr. Santomauro joined the staff at Kenmore Mercy Hospital in 1963 and retired with emeritus status in 1995. He was president of the hospital’s medical staff in 1977. He also practiced at DeGraff Memorial Hospital in North Tonawanda. Active in the Medical State Society of New York, he was a former member of its executive board and for seven years was an MSSNY delegate to the American Medical Association. He had been an officer in the MSSNY Political Action Committee since 1993 and served for 14 years as chairman. He was past president of the Erie County Medical Society and the Buffalo Surgical Society. Survivors include four daughters, Melissa Rush, Mary Pilat, Karen Albert and Susan; a son, James A; 14 grandchildren; and six great-grandchildren. Another daughter, Leslie Ann, died in November. A memorial service will be held at 10 a.m. May 11 in the UB Newman Center, 495 Skinnersville Road, Amherst. 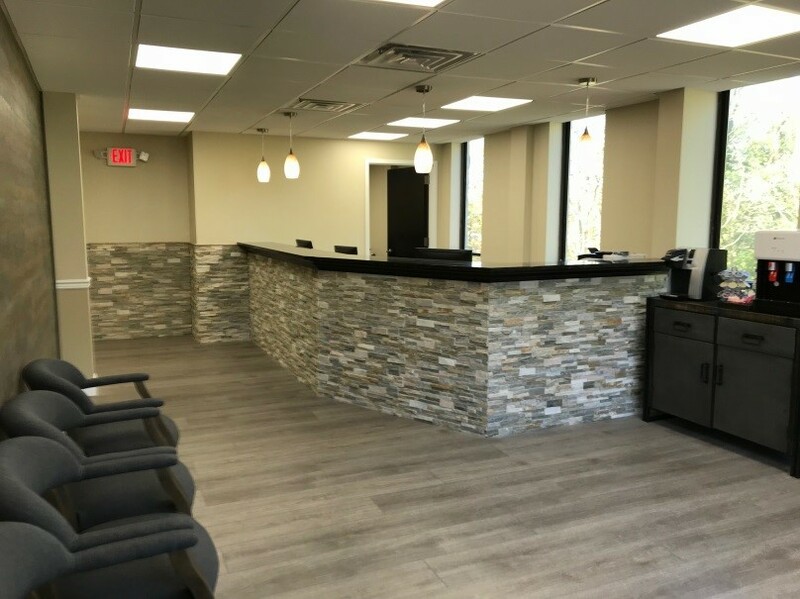 On Park Ave, for sale is a large medical office, in a beautiful full service co-op with two entrances, one of which is an impressive doorman in lobby entrance.The office has high ceilings, easily adaptable to any specialty and priced to sell. Three good size rooms easily converted to five exams, plus consult, bathroom, reception and large waiting room. Outstanding location. A must see. View floorplan http://ow.ly/kKOI30o6MjI. Call Jeff Tanenbaum, 646-234-2226 or email jtanenbaum@halstead.com for showings and more information. Office Rental 30 Central Park South. Two fully equipped exam, two certified operating, bathrooms and consultation room. Shared secretarial and waiting rooms. Elegantly decorated, central a/c, hardwood floors. Next to Park Lane and Plaza hotels. $1250 for four days a month. Available full or part-time. 212.371.0468 / drdese@gmail.com. Facing Central Park in exclusive building, ground floor, separate entrance. Perfect for psychiatrist, physiatrist, osteopath, or other. 880 5th Avenue (between 69th and 70th Sts. ), New York, N.Y. Wonderful office share in terrific location at great price. Available Monday, Wednesday, Friday and weekends. 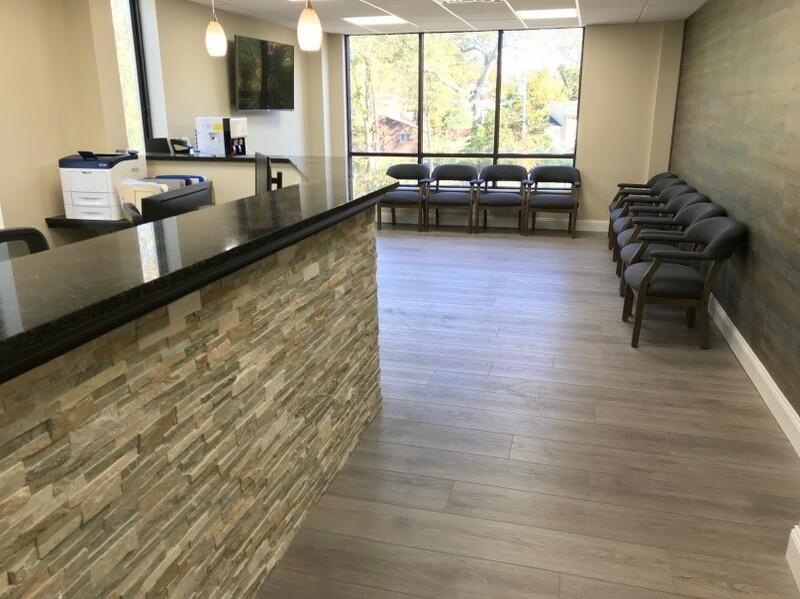 Choice of smaller windowed consultation room with adjoining exam room or big windowed consultation room with one or two exam rooms. Beautiful bright rooms, lovely reception area and front . First-rate building on 58th Street between Park and Lexington. Rent by day (about $180). Front desk and office management available if needed, along with many other amenities, including internet, ultrasound, EMG Kitchen, optional C Arm. Willing to make changes for new tenant. Call 646-642-0700. Concept: An exciting opportunity for the right person to provide leadership for physicians Salary: Commensurate with experience Job Description: Direct day-to-day operations of the Onondaga County Medical Society Some evening meetings, travel required. Requirements: Experience with leading political advocacy; political sophistication. Must know how to interface with government officials. Good networking and communication skills. Conversant with budgets and finance. Excellent media relations skills, including electronic, social media, and written communications. Familiar with medical issues and comfortable discussing them. Education: BA/BS required. MPH or MBA desirable. We expect innovation and project initiation. The Executive Director will receive a contract that increases remuneration commensurate with membership growth. Application Instructions: Please direct your application to: Dr. Brian Johnson, johnsonb@upstate.edu. Seeking motivated, enthusiastic pediatrician for P/T position in solo practice in Long Island. Coverage will increase over time. Great opportunity for those seeking part time hours in an established practice. Fax resume to 516-858-2389. 98point6 is a healthcare technology company committed to delivering more affordable, accessible, high-quality primary care. To support our mission, the insights of forward-thinking physicians like you are invaluable. Members of our exclusive Primary Care Council have no clinical responsibilities and are generally compensated for participation, which requires only a few hours per year. March 27, 2019, Westbury, NY— As National Doctor’s Day approaches on March 30, the fact that New York has once again received the dubious distinction as the worst state in country to be a physician should be an embarrassment for our great state that has a reputation for having a world class health care system. 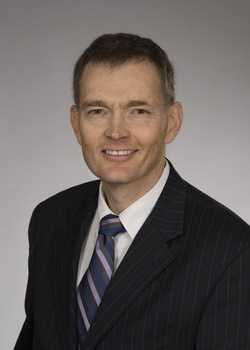 “Whether it’s our exorbitant and crushing medical liability insurance costs, having among the lowest Medicaid fee schedules in the country, or the excessive amount of mandates placed on physicians delivering care to their patients, it is becoming increasingly difficult for physicians to remain in practice here to provide needed patient care,” said Dr. Thomas Madejski, President of the Medical Society of the State of New York. 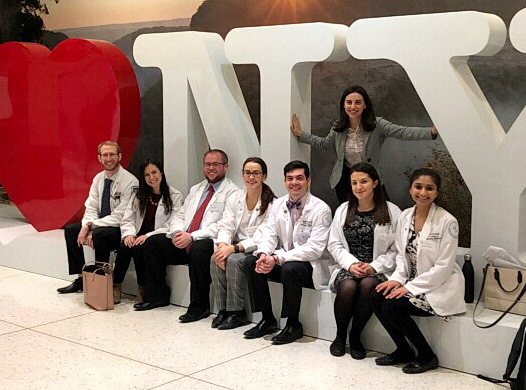 New York continues to lose a majority of the resident physicians that are trained in the state, in part due to this challenging practice environment. March 22, 2019—We, the undersigned, as presidents of our state medical societies, have joined together to express our mutual opposition regarding our states’ approval of any policies that legalize recreational marijuana. We have serious concerns about the lack of scientific evidence that supports recreational marijuana use by adults and young adults. Most importantly, not enough research has been done to prove marijuana is safe. We must look at the potential effect legalization will have on overall use and significant harms, including impaired driving and accidents, creation and worsening of severe mental health issues, and negative impacts on developing minds. We also must look at the data from other states where there has been an increase in teen usage and an increase in car accidents. The huge increase in teen vaping causes great concern and it is very possible that we will have a similar situation with legalized marijuana. We need to learn the lessons from history to ensure that any legalized marijuana product does not become the Big Tobacco of the 21st Century. States that are rushing towards legalization of recreational marijuana are ignoring how profit-driven corporations hooked generations of Americans on cigarettes and opioids, killing millions and straining public resources. We are in full agreement that calls for a rescheduling of marijuana from a Schedule I drug to a Schedule II classification. As a Schedule II drug, government funding can be sought for necessary research that clearly defines the positive and negative elements of marijuana use. When we have the science, we can make a qualified and quantified decisions about legalization. To date, ten states have legalized recreational marijuana. Let’s stop the tide now. While we are cognizant of the legal inequity that is all too often attached to marijuana use, we agree with the AMA that public-health-based strategies are a better solution than either the old commitment to incarceration or this new attempt to dodge the problem through legalization. We must keep patients first and ahead of profits and taxable revenue. As physician leaders, we agree, as one voice, that the legalization of recreational marijuana does not serve the best interests of our patients nor will it serve the best interest of our states. “MSSNY thanks the Assembly and Senate for unanimously passing legislation (A.3276, Joyner/S.1819, Rivera) to establish a Maternal Mortality Review Board for the purposes of reviewing data and information related to maternal mortality and morbidity. We also thank Governor Cuomo for advancing this issue through inclusion in his Executive Budget both this year and last year. “The report released last week by the Governor’s Task Force on Maternal Mortality and Disparate Racial Outcomes highlighted the pressing need for aggressive action to confront this problem affecting maternal health, particularly for women of color. The rate of maternal deaths in New York State is unacceptable and must be confronted with bold action. We are optimistic that the Review Board created through this legislation, to consist of experts in the field of maternal health, will set forth important findings, recommendations and treatment interventions that can be used by hospitals, physicians and other health care providers to reverse this troubling trend. The complaints we receive of misguided prior authorization hassles continue to grow, with deleterious effects on the health of our patients and reducing our satisfaction with being able to provide good quality care to our patients. I spent substantial time on the phone today trying to get authorization for buprenorphine for treatment of pain for one of my patients. This was denied because I did not indicate they had a substance use disorder which they do not really have but are habituated to narcotics. Buprenorphine may be safer for long-term regimen for patients who require Opioid medication for chronic pain. My staff and I spent over an hour going through the regular approval process and unfortunately, similar to my experience a few weeks ago, I had difficulty reaching one of the medical directors to discuss the patient. I finally did receive a call from a pharmacist. She is not a trained clinician to prescribe medication and really was unable to comprehend the needs of my patient. She was very pleasant and hopefully will arrange for the medical director to contact me so that my patient can get the proper care that she needs. Rationing by inconvenience needs to stop. We need to fix the system. The time has come to finally enable independently practicing physicians to have the right to collectively negotiate contracts with health insurance companies. A recently released American Medical Association (AMA) survey reported that 91% of responding physicians said that the prior authorization process delays patient access to necessary care; with more than 25% of the respondents indicating that a PA process led to a serious adverse event. Moreover, 86% said that burdens associated with prior authorization were high or extremely high; and 88% reported that these PA requirements had increased in the last 5 years. During our advocacy day on March 6, we were pleased by the commitment demonstrated by Assembly Health Committee Chair Richard Gottfried and Senate Health Committee Chair Gustavo Rivera to advancing legislation (A.2393/S.3462) they sponsor to enable physicians to collectively negotiate patient care terms with market dominant health insurance companies. The bill is based upon the “state action doctrine”, a concept articulated by the US Supreme Court several decades ago, which enables a State to permit conduct within its borders that would otherwise be prohibited by antitrust law to vindicate a legitimate public interest provided the state closely monitors this conduct. In this case, the public interest is preserving the ability of physicians (and other health care practitioners) to be able to fairly negotiate with insurers who have a dominant market positions to ensure patients can receive the timely care they need and deserve. The bill would require the Commissioner of Health to oversee such negotiations, including permitting such negotiations to go forward in the first instance and approving whatever is ultimately agreed to by the parties. In previous legislative sessions, the bill would advance from the Health committees of the Assembly and Senate to their respective house fiscal committees, but would advance no further. This is where we need your help. Please urge your legislators to sign on as a co-sponsor to this critically important legislation. You can send a letter to your local Assemblymember and Senator here. Right now, there are nearly 60 co-sponsors of this legislation in the Assembly (please click here for a full list) but it would stand a better chance of being passed if we can increase that number. Furthermore, while several Senators have indicated their conceptual support for the legislation, none have officially joined as co-sponsors. We need your help to have Senators add their names to be listed on this bill as a co-sponsor. MSSNY staff and I had a telephone conference with county and specialty society leaders to coordinate activity within your home district to visit legislators and talk with them about the issues that we have concerns about. Face-to-face meetings with your legislators are the best way to move our agenda forward. Please contact your county society to coordinate activity in the home district. Once the State Budget is completed by (hopefully) April 1, the Legislature will turn in its attention to other non-fiscal policy items. Please help to ensure that this item will become a legislative priority for the Assembly and Senate. With a State Budget due by April 1, the Assembly, Senate and Governor are entering into the final days of negotiations trying to finalize the Budget. Here is a quick synopsis of some of the top issues being advocated by your Medical Society. MEDICAID – Both the Assembly and Senate rejected the proposed estimated $80/patient Medicaid cut for deductibles for patients covered by Medicare and Medicaid. Moreover, the Assembly and Senate both rejected the 0.8% across the Board Medicaid payment cut. The Assembly and Senate also rejected the proposed repeal of the “prescriber prevails” protections in Medicaid. Please click here: to send a letter to your legislators and the Governor urging that they continue the fight to prevent these cuts. LEGALIZING RECREATIONAL MARIJUANA – The Assembly and Senate did not include the Governor’s proposal to legalize “adult use” or recreational marijuana in its Budgets, though leadership in both Houses have publicly stated their desire to continue working with the Governor on legislation to enable such use. This week MSSNY participated in a press conference with a diverse array of organizations including the PTAs, Substance abuse treatment providers, County Health Officials, and Sheriffs Please click here: urging that this proposal be removed from State Budget negotiations. This week the Senate and Assembly passed legislation to create a Maternal Mortality Review Board (A.3276, Joyner/S.1819, Rivera) instead of acting on the Governor’s Budget proposal (see related article). The Senate accepted the Governor’s recommendation to raise the age of tobacco/e-cigarette sales from 18-21. The Assembly did not, because they already passed “stand-alone” legislation on this issue (A.558, Rosenthal). PBMs – The Senate accepted the Governor’s recommendation to license PBMs, and including provisions to enhance penalties for non-compliance. MSSNY supports this proposal. The Assembly did not include it in their one-house indicating that it will pursue “stand alone” legislation to regulate PBMs in New York State. The New York State Legislature this week passed a measure supported by MSSNY and ACOG, District 2 to establish a Maternal Mortality Review Board for the purposes of reviewing data and information related to maternal mortality and morbidity in New York State. The board will also assess the cause of death and analyze any possible preventable factors in order to develop strategies for reducing the risks of harm and death. Prohibiting an insurer from taking any adverse action in retaliation for the physician filing a complaint, making a report, or commenting to a government body regarding policies and practice that violate this statute. The Medical Society of the State of New York is proud to announce a live continuing medical education (CME) webinar on a women’s health topic entitled “Health Matters for Women: Endometriosis” on Tuesday, April 23rd, 2019 from 7:30 AM to 8:30 AM for all physicians and other health care providers. Registration for the webinar is now open. Health Matters for Women: Endometriosis. Register here. There is a direct connection between traumatic brain injury (TBI) and PTSD. Learn more about signs and symptoms at MSSNY’s April 4th webinar. Veterans Matters: PTSD & TBI in Veterans. Register here. Explore military culture and methods to overcome unique barriers to treatment intrinsic to military culture. The Medical Society of the State of New York will conduct a webinar entitled Disaster Medicine: Every Physician’s Second Specialty on March 27, 2019 at 7:30am. Describe available courses, resources and organizations to obtain disaster preparedness education and training. Medical Matters: What’s Your Diagnosis? Infectious Diseases -Register here. Improving Maternal Mortality Trends in New York State – Seminar and Panel Discussion- Register here. Glen Falls (N.Y.) Hospital has reached a settlement with Cerner over losses it sustained when Cerner’s billing system did not work, according to The Post-Star (3/18). Glens Falls Hospital President and CEO Dianne Shugrue announced the settlement in an ad in The Post-Star. However, the ad didn’t include the terms of the settlement or when it was reached. The hospital ran the ad after The Post-Star published a report detailing “collection issues” the hospital experienced after implementing a new Cerner billing system in November 2016. According to an audit report cited by The Post-Star, Glens Falls Hospital was unable to collect on $16.3 million in bills in 2016, and that number rose to $54 million in 2017. The auditors attributed $38 million of the increase to “collection issues” caused by the switch to Cerner. The hospital’s ad said the billing problems lasted for two years. “It was a serious, short-term issue and it’s fixed,” Ms. Shugrue said in the ad. Ms. Shugrue told The Post-Star the terms of the hospital’s settlement with Cerner are confidential. She said both parties were satisfied by the settlement. Dr. Rose Berkun and Dr. John Gillespie to host a dinner reception in support of MSSNYPAC at the home of Dr. Berkun on Thursday, March 28, 2019 from 6-8pm. View Invitation or visit ww.mssnypac.org/events. Donation of $99/person to MSSNYPAC is suggested and RSVPs can be made to nadolnyc@wnydocs.org or by calling 716-852-1810. 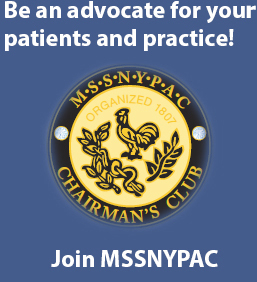 MSSNYPAC is the non-partisan political arm of the Medical Society of the State of New York which provides New York State physicians with the opportunity to build and strengthen relationships with elected leaders in the New York State Legislature and statewide offices. Joining with your colleagues to express your ideas about to inform and shape the policy decisions being made affecting physicians and the patients to whom they provide care is a critical aspect of the practice of medicine. We thank you for adding your voice and for investing in the future of medicine. If you are unable to attend but still wish to support, visit www.mssnypac.org/contribute. Thank you. New guidelines say that daily, low-dose aspirin should be used infrequently to prevent primary cardiovascular disease. The American College of Cardiology and the American Heart Association conclude that aspirin should be reserved for people with the highest cardiovascular risk and the lowest risk for bleeding. The guideline categorically recommends against aspirin use in those over age 70 and in those at high risk for bleeding, such as patients with chronic renal disease or thrombocytopenia. The guidelines were published in JACC and Circulation and presented at ACC’s annual meeting. For patients with type 2 diabetes and other cardiovascular risk factors, metformin is the first-line treatment. GLP-1R agonists and SGLT-2 inhibitors may now be considered to help reduce CVD risk. Adults should aim to get at least 150 minutes of moderate or 75 minutes of vigorous physical activity a week, which is consistent with prior guidance. Statins are recommended with lifestyle changes for patients with elevated LDL levels (at or above 190 mg/dL), type 2 diabetes, or other cardiovascular risk factors. In an over 8,000 word article, Fortune (3/18) and Kaiser Health News report on the growing utilization of electronic health records (EHRs) and some of the associated problems. The article suggests that when EHRs were adopted they were promoted as a way to make healthcare more efficient, but many healthcare providers say they have had the opposite effect. The article mentions that federal officials, including CMS Administrator Seema Verma and officials at the Food and Drug Administration, have criticized the implementation of EHRs and called for more oversight. As federal lawmakers work to reach a consensus on a surprise billing solution, insurers and hospitals are debating the issue. Representatives of employees, large and small American businesses, health insurance providers and brokers sent a letterMarch 18 urging congressional leaders to act this year to pass legislation that will protect patients from surprise medical bills and reign in rising healthcare costs. The letter — which was signed by nearly 20 groups, including America’s Health Insurance Plans and BlueCross BlueShield Association — said surprise billing legislation should protect patients by banning physicians from sending such bills to patients in situations of emergency, involuntary care, or situations where the patient was unable to choose their provider. It also advocates for requiring that facilities notify patients of whether their physician is in the insurance company’s network and potential options for receiving care from a different provider, without requiring patients to agree to out-of-network care. The authors said legislation should also make sure these protections apply to all health plans, including self-funded plans. The letter opposes using arbitration processes that can keep patients in the middle of disputes between the service provider and insurer and result in higher coverage costs. The data submission deadline for Merit-based Incentive Payment System (MIPS) eligible clinicians who participated in Year 2 (2018) of the Quality Payment Program is two weeks away. Data can be submitted and updated any time until 8:00 p.m. ET on Tuesday, April 2, 2019. CMS Web Interface users need to report their Quality performance category data by 8:00 p.m. EST on March 22, 2019. Clinicians who reported Quality measures via Medicare Part B claims can sign in to qpp.cms.gov to view current performance based on claims that have been processed by your Medicare Administrative Contractor. If you are working with a third-party intermediary to submit data on your behalf, we encourage you to sign in to the Quality Payment Program website during the submission period and review the submission for accuracy. Data cannot be resubmitted after the submission period closes. If you’ve signed in to qpp.cms.gov before or have an account with one of the PV/PQRS roles that lets you submit QPP data, you can use those credentials (user ID and password) to sign in at https://qpp.cms.gov/login. If you’ve never signed in to qpp.cms.gov before, or don’t have an account with one of the PV/PQRS roles that lets you submit QPP data, you’ll need to create an account before you can sign in. Review the QPP Access User Guide and click Register on the sign in page so you can sign in to submit, or view, data. Note: Clinicians who are not sure if they are eligible to participate in the Quality Payment Program can check their eligibility status using the QPP Participation Status Tool. To learn more about how to submit data, please review the 2018 MIPS data submission FAQs, User Guide and video series available in the QPP Resource Library. Wonderful office share or sublet in terrific location at great price. Available Full time or Part time. 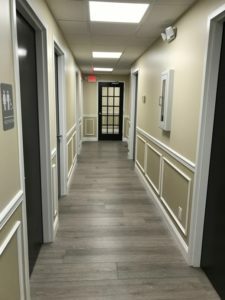 Choice of smaller windowed consultation room with adjoining exam room or big windowed consultation room with one or two exam rooms. Beautiful bright rooms, lovely reception area and front lobby. First-rate building on 58th Street between Park and Lexington. Front desk and office management available, along with many other amenities, including internet, ultrasound, EMG Kitchen, optional C Arm. Willing to make changes for new tenant. Call 646-642-0700. “The physician community thanks the New York State Senate and Assembly leadership for rejecting, in their respective “one-House” Budgets, a number of proposals contained in the Executive Budget that could adversely impact patient access to needed care and treatment. The Senate and Assembly Budgets would prevent a huge proposed cut to physicians who treat patients covered by both Medicare and Medicaid—the elderly and the poor. “Also, both houses importantly rejected a proposal that would have imposed new prior authorization requirements on physicians and other care providers who want to assure their Medicaid patients can obtain the medications they need. If enacted, these measures would undoubtedly lead to increased care delays for our state’s most vulnerable patients. MSSNY and our County Societies, along with a coalition of other interested groups have been successful in slowing the expansion of marijuana availability in New York State. I was told when I came into the Presidency that marijuana was a done deal. MSSNY and the AMA have excellent policy on a rational approach to dealing with marijuana. I asked our County leaders to attend listening sessions across the state this past spring and summer. We often were alone voice against anecdotal reports of the benefit with medicinal and recreational use. Through those efforts, we have been successful in raising significant questions about the effect of legalization on overall use and significant harms with regards to impaired driving and accidents, creation and worsening of severe mental health issues, and negative impacts on developing minds. I am very sympathetic to our governmental leaders who are concerned about the effects of legalization in Massachusetts and Canada and the effect on our citizens and potential lost tax revenue. Having said that, I believe it would be pennywise and pound foolish to follow a path to legalization based on the emerging harms associated with increased use of marijuana in states that have legalized non medicinal use. I have discussed coordinating a campaign to stop the expansion until we have sufficient data on the efficacy and long term implications of use for medicinal marijuana. I have had discussions with leaders from Connecticut, Pennsylvania, and New Jersey about coordinating campaigns to slow the descent towards marijuana induced psychosis. They are reviewing policy and we hope to expand our voice by adding additional physician and community groups who share our concerns. I look forward to updating you on developments as they occur. I am quite thankful for the activities of our County Medical Societies in this battle for public health and improvement in the practice of medicine. I am arranging a meeting of the County Presidents and their Executive Staffs with MSSNY to enlist them again in reaching out to their legislators and other decision makers at home to promote the MSSNY prescription for the proper use of marijuana in New York State. To review and address issues with criminal justice, disparate enforcement, and stigmatization associated with low level users. To reschedule marijuana to Schedule II based on some promising, but still largely anecdotal reports on its utility for certain conditions. If rescheduling can be attained, well-funded research can educate us as to the utility and harms of this complicated product. To oppose further expansion of non-medical use until the effects of long term use are clarified, States that have legalized should collect data on long term efficacy and side effects. States with legalization can provide further data that develops over the next few years. You can help. Send a letter to your representatives here. Encourage your colleagues and staff who share our concerns to do likewise. This week, the New York State Senate and Assembly each passed their respective “one-House” Budget proposals in response to the Governor’s Executive Budget proposal released in January, and amended in February. They will now enter a period of intense negotiations to achieve an agreed upon final Budget by April 1, the start of New York’s fiscal year. Here is a brief summary of the actions taken on key items of concern to physicians and patients that were proposed in the Governor’s Budget, both positive and negative. MEDICAID – Both the Assembly and Senate rejected the proposed $80/patient Medicaid cut for deductibles for patients covered by Medicare and Medicaid. Moreover, the Assembly and Senate both rejected the 0.8% across the Board Medicaid payment cut. Both the Assembly and Senate also rejected the proposed repeal of the “prescriber prevails” protections for prescriptions for patients covered by Medicaid. The Assembly also included a proposal to have a uniform formulary for Medicaid prescriptions, including for Medicaid Managed Care plans, keeping prescriber prevails protections. MSSNY President Dr. Thomas Madejski issued a statement praising the Assembly and Senate for taking these actions. Read his statement here. Please click here to send a letter to your legislators and the Governor urging that they continue the fight to prevent these cuts. LEGALIZING RECREATIONAL MARIJUANA – The Assembly and Senate did not include the Governor’s proposal to legalize “adult use” or recreational marijuana in its Budgets, though leadership in both Houses have publicly stated their desire to continue working with the Governor on legislation to enable such use. Several county Executives announced this week that they would seek to opt their counties out of permitting recreational marijuana use if it is to be legalized in New York. Please urge your legislators to continue to oppose so-called “adult use” marijuana here. EXCESS – Both the Assembly and Senate supported the continued historical funding amount for the Excess Medical Malpractice Insurance Program that had been proposed in the Governor’s Budget. PBMs – The Senate accepted the Governor’s recommendation to license PBMs, and included provisions to enhance penalties for non-compliance. The Assembly rejected the provision, indicating that it will pursue “stand alone” legislation to regulate PBMs in New York State. PUBLIC HEALTH – The Senate accepted the Governor’s recommendation to raise the age of tobacco/e-cigarette sales from 18-21 that was supported by MSSNY. The Assembly did not, but because they already passed “stand-alone” legislation on this issue (A.558, Rosenthal). The Senate accepted the Governor’s recommendation to create a Maternal Mortality Review Board that was supported by MSSNY. The Assembly did not, but could likely pass their own legislation (both the Assembly and Senate have legislation on the floor of each of their respective Houses-A.3276, Joyner/S.1819, Rivera). The Senate accepted the Governor’s proposal to remove prior authorization requirements for Medication Assisted Treatment (MAT) that was supported by MSSNY and the AMA. The Assembly took it out, but is pursuing their own legislation (see related article). WORKERS’ COMP – The Assembly rejected the Governor’s proposal to significantly expand the use of non-physician use in Workers’ Compensation that has been opposed by MSSNY (due to the lack of provisions regarding how such practitioners would coordinate with physicians to manage the patients’ care and complete the necessary paperwork). However, the Senate accepted the approach. The Assembly Insurance Committee has advanced two bills that would help to ensure availability of better treatment for mental health and substance abuse disorders. Both have moved on to the Codes Committee for review. Assemblymember Dan Quart’s A.2904 would prohibit certain insurance policies from requiring prior authorization for buprenorphine products, methadone and long acting injectable naltrexone for detoxification or maintenance treatment of substance use disorders. This bill would allow physicians to better care for those suffering from opioid addiction via easing restrictions on medication-assisted treatment (MAT). Assemblymember Aileen Gunther’s A.6186A would require insurers and health plans to submit data to the Department of Financial Services which would be used to measure compliance with federal and state mental health and substance abuse parity laws. It provides clarifications to the law enacted last year supported by MSSNY. 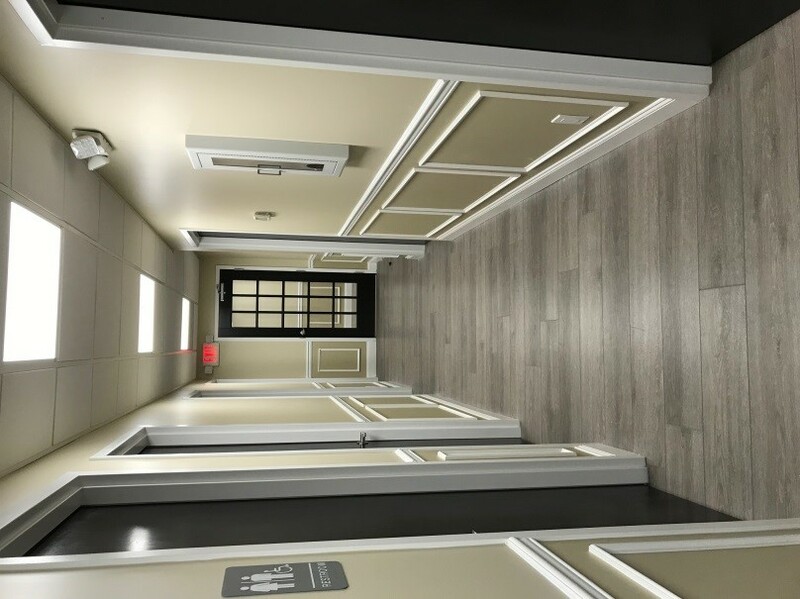 While parity laws currently exist both federally and at the state level, in the past few years the NYS Attorney General has reached multiple settlements for noncompliance with behavioral health companies and subcontractors. Greater data collection is clearly needed for proactive monitoring of denial rates and network adequacy, among other standards. Senator Gustavo Rivera’s bill S.4183 has passed through the Senate Health Committee and is now eligible for a vote in the Senate. The bill is a companion of Assembly bill A.1034-A which passed the Assembly on February 28. If enacted, this legislation would exempt nursing homes’ prescription of oral medication from the state requirement that all prescriptions be electronically submitted. This bill is of particular interest to MSSNY’s Long-Term Care subcommittee. Medical Matters: Disaster Medicine: Every Physician’s Second Specialty – Register here. Physicians are encouraged to pre-register for the many educational programs for physicians offered at the MSSNY House of Delegates. Review how the increased role of women in the military has impacted their mental health. Describe mental health concerns unique to women veterans and how to identify and treat them. Identify the barriers that women veterans face in getting the specific care they need. Improving Maternal Mortality Trends in New York State (Live Seminar and Panel Discussion) – Register here. The Medical Society of the State of New York designates this live activity for a maximum of 2.0 AMA/PRA Category 1 credits. Physician should only claim credit commensurate with the extent of their participation in the activity. “Health Matters for Women: Fibromyalgia and Myalgic Encephalomyelitis” on Thursday, March 21st, 2019 from 7:30 AM to 8:30 AM and “Health Matters for Women: Endometriosis” on Tuesday, April 23rd, 2019 from 7:30 AM to 8:30 AM for all physicians and other health care providers. Registration for the webinars is now open. As you are aware, MSSNY and its General Counsel are still awaiting clarification from the DOH on a variety of issues being proposed by ZocDoc. We anticipate getting the clarification prior to the ZocDoc roll out in April. MSSNY will advise our members of any changes as we get closer to the implementation date. The Wall Street Journal (3/11) reports that hospitals and insurers plan to argue against a Trump Administration proposal that may mandate the public disclosure of medical services’ negotiated prices. Healthcare industry groups are questioning the government’s legal authority to require public disclosure, and asserting that such a requirement would be too complex to carry out. As some technology companies have announced steps to combat the spread of vaccine misinformation, the American Medical Association (AMA) issued a letter to the CEOs of six of the country’s leading social media and technology companies urging them to ensure their users have access to accurate, timely, scientifically-sound information on vaccines. The following letter was sent to the CEOs of Amazon, Facebook, Google, Pinterest, Twitter and YouTube. The issue of sexual harassment takes on particular significance for the healthcare industry, because there is an established nexus between disruptive behavior, which includes sexual harassment, and adverse patient outcomes and medical errors. The live webinar will be presented on March 20, 2019, from 12 noon to 1:00pm. For those individuals who are unable to participate in the webinar at that time, MSSNY will be placing a recorded version of that webinar on the MSSNY website to facilitate access to the webinar for MSSNY members. How to identify the more subtle forms of sexual harassment. The impact of sexual harassment on the quality of care and the victim. Practical advice on how to diminish and prevent sexual harassment at your practice. How to respond to sexual harassment in the workplace. Guidelines on how to comply with statutory mandates relating to sexual harassment. Garfunkel Wild offers individual or group training, on-site or off-site training, as well as webinar modules that can serve to satisfy this new statutory mandate for your employees. If you would like to set up a personal training, please contact Andrew L. Zwerling at 516-393-2581 or azwerling@garfunkelwild.com. The establishment and implementation of medical standards and criteria for the retrospective and prospective DUR program. The development, selection, application, and assessment of educational interventions for physicians, pharmacists and recipients that improve care. The collaboration with managed care organizations to address drug utilization concerns and to implement consistent management strategies across the fee-for-service and managed care pharmacy benefits. The review of therapeutic classes subject to the Preferred Drug Program. CVs associated with interest in becoming a DUR Board member are accepted continuously and can be submitted to the DUR Board mail-box at dur@health.ny.gov. If no vacancies exist, CVs will be kept on file for consideration once a position becomes available. Questions on membership and candidacy can be directed to the DUR Board Member Liaison, Robert Sheehan, at dur@health.ny.gov or 518-486-3209. For more information about the NYS Medicaid DUR Board please go here. Jurisdiction K providers may access the survey at 2019 Jurisdiction K MSI Survey. March 8, 2019 – Physicians and Politicians Have Their Say! Wednesday March 6th in Albany was a great day to be a MSSNY member. I want to thank each and every one of the hundreds of physicians, medical students, and MSSNY, county medical society and specialty society staff who took the time to participate in this week’s Albany Physician Advocacy Day. Your MSSNY leaders very much understand the challenges with taking a day away from your patients. I hope your colleagues appreciate your efforts on their behalf. And please ask them to pencil in March 4, 2020 so they can plan to join you for next year’s Albany Physician Advocacy Day. MSSNY is the big tent which brings all New York physicians together. I was honored to have four of our specialty societies join us and participate in our advocacy efforts. A special thank you to Dr. Vilma Joseph from the New York State Anesthesia Association, Dr. Louis Snitkoff from the American College of Physicians, Dr. Iffath Hoskins from ACOG District 2 and Dr. Michael Delman from NYSAM. I appreciate very much their updates in specialty-specific concerns that are part of our overall MSSNY program and the attendance of their staff and members to raise our voice on behalf of our patients. I was very impressed by the thoughtful questions raised by our physicians and the detailed responses they received from our Wednesday morning panelists. The physicians heard from Assembly Health Committee Chair Gottfried, Senate Health Committee Chair Rivera, Assembly Insurance Committee Chair Cahill and Senate Insurance Committee Chair Breslin. 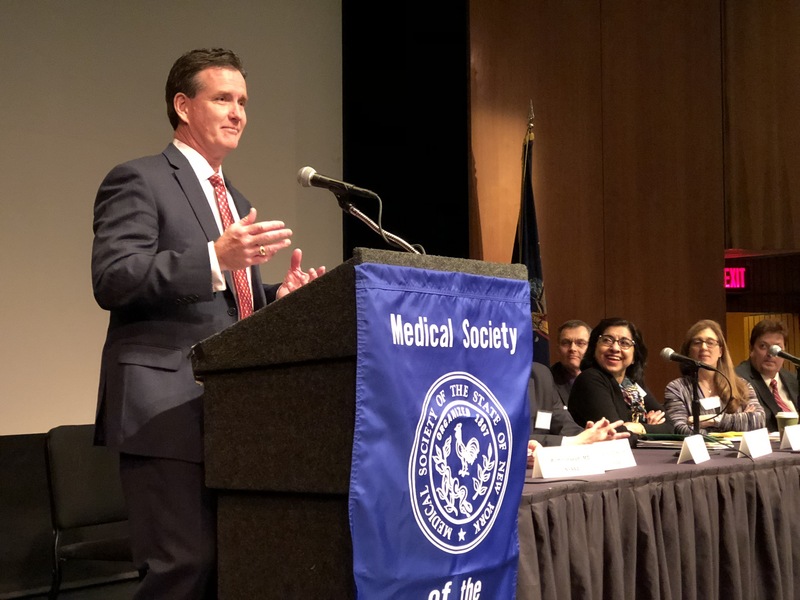 We also heard from Senate Republican leader John Flanagan, and Troy Oechsner, who oversees the regulation of the health insurance industry for the New York Department of Financial Services. MSSNY leadership and some of our specialty society colleagues subsequently met with new Senate Majority Leader Andrea Stewart Cousins, and the top healthcare policy staff to Assembly Speaker Carl Heastie. Moreover, many physicians and county society executives held meetings with their local Senators and Assembly members. While many topics were discussed relative to patient care delivery, the most extensive discussion was regarding the proposed “New York Health Act,” recreational marijuana legalization, and policy responses to the increasing consolidation in the health care and health insurance industries. Assemblyman Gottfried saluted MSSNY for our discussion and engagement with regards to crafting the New York Health Act. I thanked him for some of the changes to his single payor bill as a result of concerns raised by MSSNY and the New York County Medical Society. Assemblyman Cahill and Senator Breslin emphasized the very careful review that is being brought to this legislation because it so far-reaching and disruptive if not done right. In afternoon meetings we were advised that the Senate would likely be organizing hearings on this legislation in different parts of the State after the Budget was completed. I was particularly pleased by the strong support among the Committee Chairs for the physician collective negotiation legislation that has been a consistent MSSNY priority. Assemblyman Gottfried noted that the bill has repeatedly been passed by the Health Committee, but then gets stalled. While the bill sponsored by Assemblyman Gottfried has 56 co-sponsors including Cahill and Assembly Majority Leader Crystal People-Stokes, it would be helpful to have many more Assemblymembers join as co-sponsors. And in the Senate, there have not been any co-sponsors listed yet. This is where I need you to be a change agent for your patients and the practice of medicine. Our Albany Advocacy day is one among many steps physicians can collectively take to achieve our public health goals. Equally important is your advocacy in the district. Make phone calls. Send letters. Schedule a meeting with your Senators and Assemblymembers. Urge your Senator and Assemblymember to support the collective negotiation legislation and ask them to join on as a co-sponsor. You can send a letter from here. Urge them to move very cautiously on any legislation to permit the use of recreational marijuana, including requesting that it be removed from consideration from the State Budget due in a few weeks. I want to thank Dr. Frank Dowling, MSSNY Secretary, and addiction treatment expert, for participating in a press conference with the group Smart Approaches to Marijuana (SAM) as well as the NYS PTA this week raising concerns with marijuana legalization. You can send a letter to your legislators here. Urge them to continue to oppose Medicaid cuts for your dual eligible patients proposed in the Budget, which we estimate to be about $80 per dual eligible patient. You can send a letter here. Want to be even more involved? Join our Physician Advocacy Liaison (PAL) program and commit to working with your local legislators on an ongoing basis. The new Assembly and Senate are still maturing in their organizational structure. Your action now is critical for us to have input into the legislative decisions that affect your patients and your practice. Join MSSNYPAC and help to elect physician friendly candidates to office and help to develop and expand existing working relationships with key legislators. Again, I want to thank all who took the time to make our Annual Physician Advocacy Day a success, especially Moe Auster, Pat Clancy and the rest of our outstanding MSSNY staff. Now let’s keep up the momentum with continued local contact with our legislators, and help New York lead the country in improving the health of our citizens, and the practice of medicine. P.S. Regarding my patient and the difficulties encountered in obtaining a prior authorization, I finally spoke to the Medical Director of the health plan involved and the issue has been resolved! 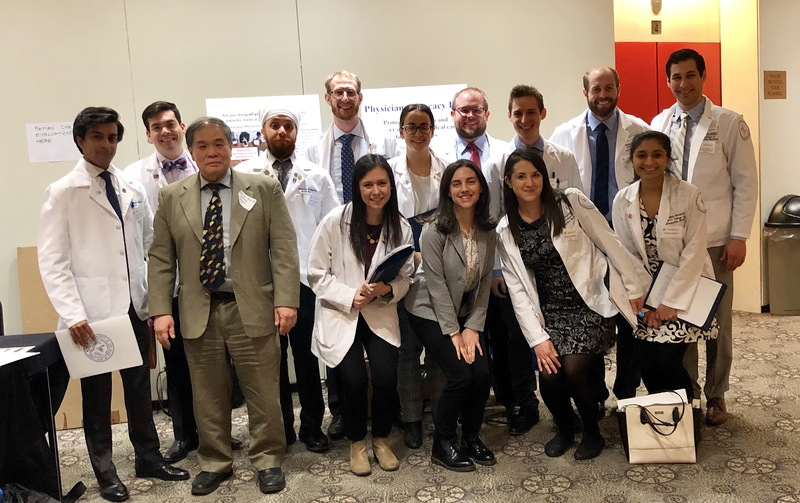 Over 200 physicians, medical students and other physician advocates converged on Albany this week to participate in MSSNY’s Annual Physician Advocacy Day, and meet with their local legislators. The assembled physicians heard from the Assembly Health Committee Chair Richard Gottfried, Senate Health Committee Chair Gustavo Rivera, Assembly Insurance Committee Chair Kevin Cahill and Senate Insurance Committee Chair Neil Breslin regarding their priorities for 2019, and to answer questions from physicians. They also heard from Senate Republican leader John Flanagan, and Troy Oechsner, who oversees the regulation of the health insurance industry for the New York Department of Financial Services. While many topics were discussed with these legislative leaders relative to patient care delivery, the most extensive discussion centered on the potential benefits and significant concerns with the proposed “New York Health Act”, concerns with legislation to permit “adult use” or “recreational” marijuana use, and the strong support for physician collective negotiation legislation (A.2393, Gottfried/S.3462, Rivera) that would enable physicians to better advocate for their patients in response to the increasing consolidation in the health care and health insurance industries. Support for important public health initiatives contained in the Governor’s Budget including licensing PBMs, raising the tobacco/e-cigarette purchase age from 18-21, creating a Maternal Mortality Review Board, and eliminating pre-authorization for Medication Assisted Treatment (MAT). By a margin of 120-26, the NYS Assembly passed legislation that would increase the purchasing age for tobacco products from 18 to 21 years of age. A.558-A S.2833, sponsored by Assemblymember Linda Rosenthal and Senator Diane Savino, is now before the Senate Finance Committee for its consideration. A March 2015 report by the Institute of Medicine concluded that raising the purchase price to 21 will have a substantial positive impact on public health and will significantly reduce the number of adolescents and young adults who start smoking, reduce smoking-caused deaths, and immediately improve the health of adolescents, young adults and young mothers who should be deterred from smoking. The Office of the National Coordinator for Health IT (ONC) released a proposed rule implementing provisions of the 21st Century Cures Act enacted by Congress in 2017 related to electronic health information blocking, interoperability and the ONC Health IT Certification Program. At the same time, he Centers for Medicare & Medicaid Services (CMS) issued a proposed rule on patient access to data and interoperability. According to an overview by the American Medical Association (AMA), provisions in these rules regarding information blocking and application program interfaces (APIs) will impact interoperability and the way data is exchanged between patients, health providers, payers, technology developers, health information exchanges, and other health care stakeholders. The proposed rules also promote laudable goals, such as patient access and price transparency. The AMA summary notes that the proposals are complex and interwoven with an array of newly defined terms. While most of ONC’s focus is on HIT developers, the information blocking proposals significantly impact physicians. There is presumption that all patient information must be shared for a large variety of purposes. The Office of Civil Rights’ (OCR) HIPAA regulation is a permissive rule, meaning that physicians and other covered entities are allowed but not required to share health information with anyone but the patient. The interaction between what must be shared and what can be shared will present a significant challenge for physicians. There is also a lack of discussion around patients’ awareness and understanding of how these rules permit other parties to obtain and use their data. Among the positive aspects include components to expand the amount of data EHRs must provide to physicians and patients; introduce a vendor information blocking condition of certification; increase ONC’s direct oversight of vendors; limit the fees vendors can charge physicians; require real-world testing of EHRs; adopt modern interoperability standards; remove vendor “gag clauses” that limit physicians from sharing health IT safety concerns; and create exceptions for information blocking rules, such as when disclosing a patient’s information could cause harm or pose a security risk to a health IT system. However, the AMA also notes that, due to the sheer number and complexity of proposals, physicians may find it difficult to understand many of these rules, and compliance could prove burdensome. The AMA further notes that the ONC (1) defines key terms, including electronic health information (EHI); (2) provides an illustrative list of activities that would be likely to interfere with access, exchange, or use of EHI; (3) codifies compliance with the information blocking provisions as a Condition of Certification; (4) introduces seven exceptions to the general prohibition on information blocking; and (5) issues a Request for Information on disincentives for health care providers. The summary further notes that the HHS Office of the Inspector General (OIG) may issue civil money penalties ($1,000,000 per incident) for information blocking conducted by health IT developers of certified health IT, health information networks, and health information exchanges. The OIG may also investigate health care providers for information blocking for which health care providers could be subject to disincentives. Health care provider penalties will be established in future rulemaking. Comments on the rules are due on May 3, 2019. MSSNY will be continuing to review these rules and will be coordinating any response through the AMA and other state medical associations. The Medical Society of the State of New York will hold a live continuing medical education (CME) webinar entitled Health Matters for Women: Fibromyalgia and Myalgic Encephalomyelitis on Thursday, March 21st, 2019 from 7:30 AM to 8:30 AM for all physicians and other health care providers. Registration for the webinar is now open. To pre-register, please click here. A copy of the flyer can be accessed from here. For assistance in registering or any other questions, please contact Ayse Ulukaya at aulukaya@mssny.org or call (518) 465-8085. The Medical Society of the State of New York is proud to announce our newest Veterans Matters webinar scheduled for March 14th at 7:30am. This webinar is entitled Military Culture: Everything Physicians Need to Know About Veterans as Patients. Register for this program here. Describe the unique aspects of military culture and how they impact patients who are veterans. Explain the Dwyer Peer-to-Peer program as a resource to assist veteran patients re-acclimating from a group to an individual mentality. Review and identify resources to improve physician’s ability to fully treat veterans who are transitioning back into civilian life. Additional information or assistance with registration can be obtained by contacting Melissa Hoffman at mhoffman@mssny.org or (518)465-8085. Physicians are encouraged to pre-register for the educational programs offered at the MSSNY House of Delegates. There is a direct connection between traumatic brain injury (TBI) and PTSD. Learn more about signs and symptoms at MSSNY’s April 4th webinar Veterans Matters: PTSD & TBI in Veterans at 7:30am. Register for this webinar here. MSSNY was instrumental in getting the pricing change delayed from their original implementation in October 2018. Updates on our ZocDoc activities have been in our weekly e-News publication. Our general counsel, Garfunkel Wild, recently met with NYS DOH on this matter. NYS DOH is reviewing MSSNY’s concerns on behalf of our members and any update will be in a future e-news. 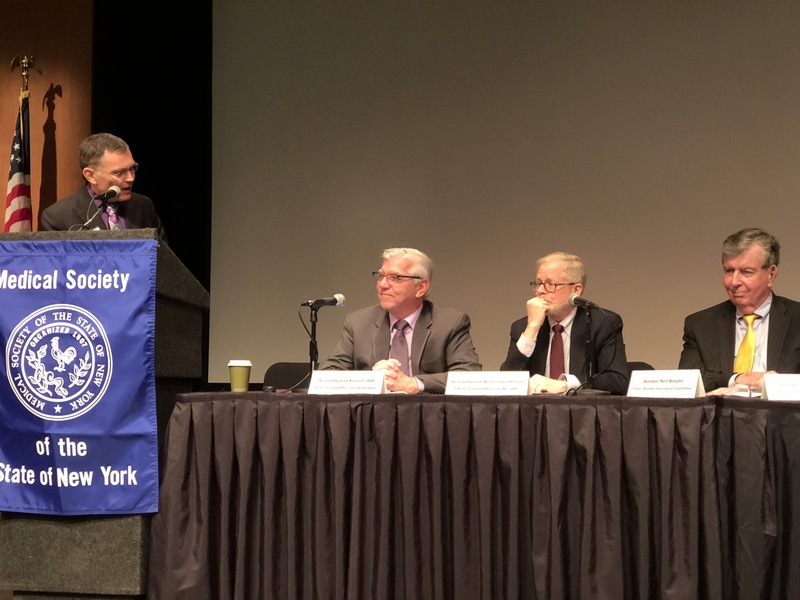 Representatives from OPMC and the Board of Medicine led a discussion on “Physician Wellness.” Presenters were Arthur Hengerer, MD, Chair, OPMC; Robert Catalano, MD, MBA, Executive Secretary, OPMC; Keith Servis, OPMC Director; and Stephen Boese, Executive Secretary, NYS Board of Medicine. They stressed that the discussion was about burnout, not misconduct, and provided a roadmap to burnout awareness efforts and physician wellness support. Following a summary of the OPMC Workgroup Discussion on Burnout, they looked at the potential for collaborative efforts with MSSNY going forward and the next steps to address Physician Wellness. Council approved the following amended substitute resolution, which was referred by the 2018 House of Delegates: MSSNY will correspond with the state Office of Mental Health, the Office of Alcoholism and Substance Abuse Services and the Department of Health to determine the mechanism for primary care physicians to access records of mental health and substance use disorders to afford those patients the best medical care. MSSNY will educate its members on what options are available and will transmit a copy of the resolution to the AMA to work towards federal regulations on the matter. The Washington Post (3/5) reports the American Medical Association and the Planned Parenthood Federation of America have filed a lawsuit over the new rule from HHS that prevents clinics receiving Title X funding from making referrals for abortion, referred to as the “gag rule.” Barbara L. McAneny, the AMA’s president, said in a statement, “Because of the administration’s overreach and interference in health-care decision-making, physicians will be prohibited from having open, frank conversations with their patients about all their health care options.” Meanwhile, HHS maintains the rule will prevent “‘co-mingling’ of funds that are used for abortion and those that are used for other types of reproductive care.” The rule also prevents clinics from sharing physical space and finances with abortion providers. HHS To Air Secret Hospitals/Physicians Negotiate With Carriers? On its front page, the Wall Street Journal (3/7) reports HHS is mulling whether to mandate that hospitals, physicians and others in the healthcare industry publicize the prices they negotiate with insurers for services, which could provide more transparency regarding the true cost of care. The department is seeking public input about whether patients are entitled to this information prior to receiving care. The Wall Street Journal (3/6) reports physicians and other experts are pushing for teenagers to be able to speak individually with their doctors. The American Academy of Pediatrics and other groups have long advocated for adolescents to be able to spend time alone with their physicians. The article quotes physicians, parents, and adolescents discussing the potential value of such time as well as some of the barriers to it. Modern Healthcare (3/6) reports that the Centers for Medicare & Medicaid Services Administrator Seema Verma announced in a blog post “revisions to the guidance surveyors use to spot immediate jeopardy, requiring them to fill out a three-question template that describes the incident.” Verma explained that the changes are due to recent media attention focused on harm at facilities, saying, “Despite stringent safeguards, alarming stories continue to be reported about people, including some of our most vulnerable individuals, who have experienced harm in healthcare settings.” CMS also removed “culpability” as one required component of immediate jeopardy, and adds psychological harm as a component. MLMIC is pleased to invite you to attend its Risk Management Program on Thursday morning, April 11, 2019, at the Westchester Marriott Hotel in Tarrytown, New York. The program will run from 9:00 a.m. to 12:45 p.m. This year’s program will address several topics including Top Risks of the Office Practice Setting, Effective Coordination of Hospitalist Care, and High Exposure Liability Cases. At this time, Garfunkel Wild will be offering a complimentary “Train the Trainers” webinar on the issue of sexual harassment. The live webinar will be presented on March 20, 2019, from 12 noon to 1:00pm. For those individuals who are unable to participate in the webinar at that time, MSSNY will be placing a recorded version of that webinar on the MSSNY website to facilitate access to the webinar for MSSNY members.